country from the English Channel Coast in Dorset to the Wash on the east coast. with its good visibility and dry underfoot conditions. 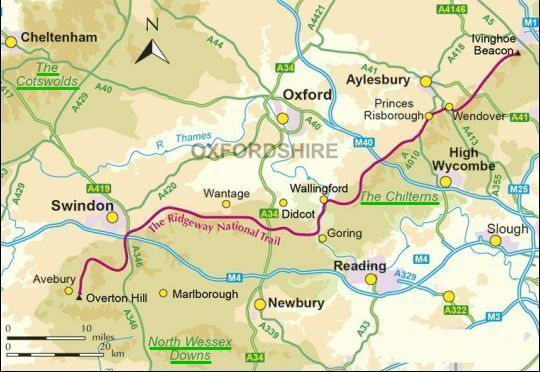 • The Ridgeway National Trail follows it from Avebury to Ivinghoe Beacon. .. - the striking figure of the Uffington White Horse. The Ridgeway’s high level track. at the prominent hilltop of Irvinghoe Beacon. • Deze route is niet ver van London. Rechts zie je nog een stukje van de M25, de London Orbital. .. - onder de North Wessex Downs/ The Chilterns een krijt cuesta. .. chalk escarpment (= krijt cuesta) van de North Wessex Downs/ The Chilterns naar Reading. .. traverses a landscape steeped in ancient history. ... - the figures of white horses cut into the chalk (= krijt). .. through the North Wessex Downs. • You’ll experience wide, open views of rolling chalk (= krijt) downland. • You are often quite a distance from villages. .. interspersed with ribbons of deciduous woodland. .. nature reserves rich in the wildlife found in chalk grassland habitats. .. refreshments and other facilities are easily available. ...Aldbury - the Chiltern Hills at its best. 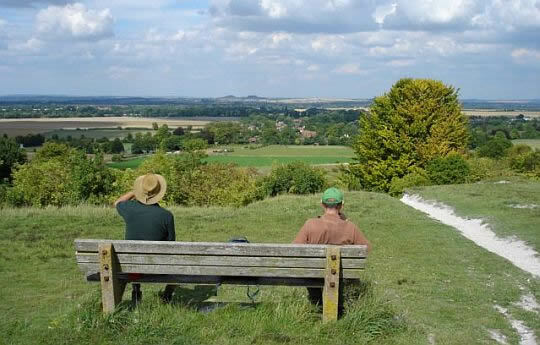 The Chilterns’ rounded hills are part of the chalk ridge which crosses England from Dorset to Yorkshire. The characteristic scarp slope, indented by combes and cut by a number of gaps, looks out north over the panorama of the Vale of Aylesbury. The dip slope, dissected by steep dry valleys, curves gently down into the London Basin. The heavily wooded character of the Chilterns, based on clay-with-flint deposits, gives way in the north to the open downland of Ivinghoe Beacon and Dunstable Downs. The Chilterns contain an important diversity of habitats ranging from chalk grassland and to the country’s most extensive areas of beech woodland, with the finest stretches protected under EU legislation as Special Areas of Conservation. The landscape contains many prehistoric traces including the great dyke of Grim’s Ditch and the ancient Ridgeway and Icknield Way. • Die beukenbossen zijn heel kenmerkend voor de Chilterns. .. Voor Engelse begrippen is een groot deel van de heuvels bebost. .. Je merkt het ook aan de vele plaatsnamen die eindigen op 'Green'. .. Dit ondanks de nabijheid van London. .. het pad vaker dorpen aan. .. vele opzichten op de Cotswolds. .. Vanzelfsprekend is het een ideaal woongebied voor de Engelse elite. .. Er liggen nogal wat dure landhuizen en parkachtige landgoederen. .. toch op niet al te grote afstand van London. .. tussen de rijkdom door kunt wandelen. parks and gentle rolling hills covering much of Buckinghamshire. inspiration for the children’s stories of Roald Dahl.
' The Ridgeway' dus met lidwoord ervoor ! highest part of the landscape. Lengte en tijdsduur: ... km. bij Van dag tot dag). • Ga je echter met trekkingrugzak en tent dan heb je zo'n indeling niet nodig. minder kilometers per dag aflegt. • Wheat and Phacelia on the downs above Letcombe Bassett. 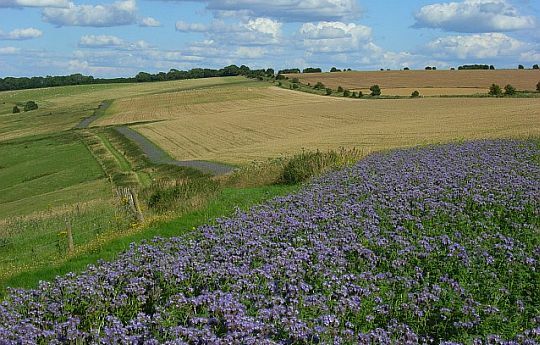 • The Phacelia has been planted in a strip separating wheat from grassland. .. It is planted as cover for gamebirds. ancient tracks that run along the high ridges of hills. They are unpaved, relying simply on the hard ground to provide a suitable surface for travelling on. modern roads tend to be located on more level, flat ground in valleys. to Ivinghoe Beacon near Tring. During Saxon and Viking times, the Ridgeway was useful to provide a track along which to move soldiers into Wessex. permanent and the route clearer. It became a National Trail in 1973. It is a public right of way. is much more to it. The views change so much; from woodland, to Didcot cooling towers, from open grassland, to the M4! The route is not short of surprises! the Ridgeway rather than the Downs, where there are fewer settlements. It is the oldest road in Britain, and indeed the route is riddled with history. is Avebury Bronze Age stone circle. It is a World Heritage Site and one of the largest prehistoric monuments of this type in Europe. • This is close to Silbury Hill, the largest man-made hill in Europe. site, constructed from the shoulder blades of oxen. .. wand ( = klif) ( cuesta-front in Nederlands). .. materiaal wordt afgevoerd door een rivier. .. Er ontstaat dan een steile helling ( cuesta - front (in het Nederlands). • Deze twee hellingen tezamen vormen een asymmetrische rug, een cuesta. • Het cuesta-front is een steile helling ontstaan door erosie. • Je loopt op de Cotswold Way langdurig bovenlangs de escarpment (= steilrand ). .. door Beuk); het onderste deel is Pasture ('hedged fields' in gebruik als weiland). walk spent mostly walking along ridges. The paths often provide splendid views over the relatively flat local landscape. • Drinkwater: is wel een probleem. Er zijn slechts enkele "water points"
(drinkwaterpunten) op de deelkaartjes ingetekend. Vul daarom telkens bij het verlaten van een dorpje de veldflessen. of the Downs, while all of the villages and springs are at the foot of the Downs. Please ensure that you carry enough water. steeds dieper in. Hierdoor ontstond een doorbraakdal. het Cuckmere-dal bij de South downs Way , en het Rijndal bij de Rheinsteig. • World Heritage Site of Avebury, with one of Europe’s largest stone circles. the Bridgewater Monument on the Ashridge Estate. 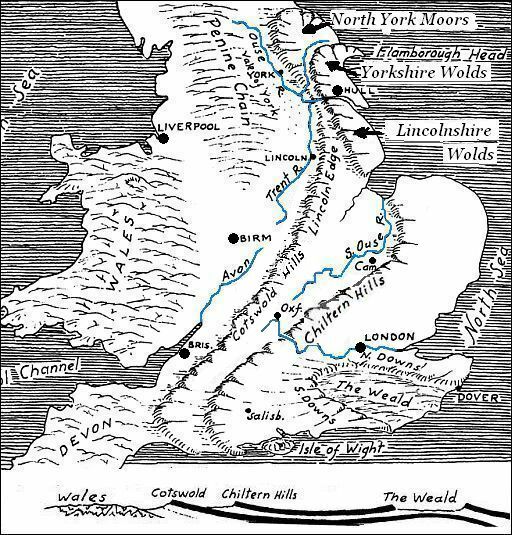 to a real sense of walking Britain’s oldest road. Megalithic monuments in Britain are mainly concentrated in western and northern areas where sources of suitable stone were widely available. • They are built between about 3800 BC and 3300 BC. ... (This is relatively early in the overall sequence of European megaliths). 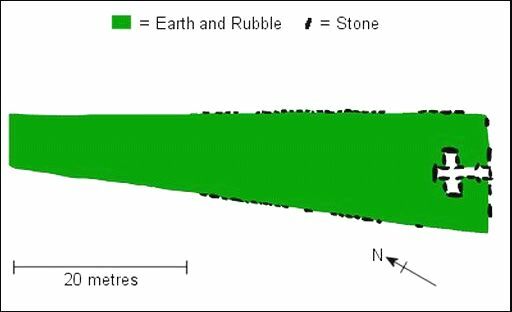 • These rectangular mounds (= heuvels) of earth and stone up to 100m long contain chambers (= kamers) variously set at the end of the mound or along the sides. result of complicated mortuary rituals. ...... - West Kennet long barrow (bij The Ridgeway). ...... - Wayland’s Smithy (bij The Ridgeway). ...... - Belas Knap (bij Cotswold Way). ...... - Hetty Pegler’s Tump (= Uley Long Barrow) (bij Cotswold Way). • They are built between about 3000 BC and 2000 BC. .. (This is relatively late in the overall sequence of European megaliths). ...... - Avebury (bij The Ridgeway). ........ (the largest stone circle in Britain, 98 pillars in a ring 332m across). barrow ........... = tumulus ; grafheuvel. long barrow ... = langgraf ( letterlijk : langwerpige grafheuvel). 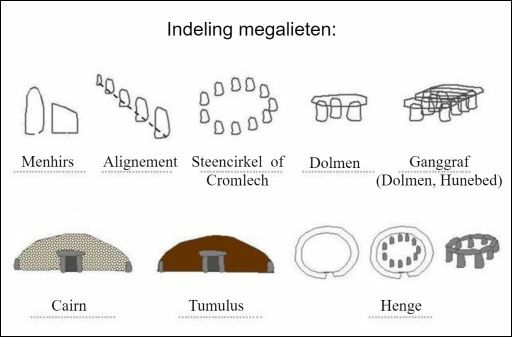 megalith..........= megaliet ; grote steen. megalithic...... = gemaakt van megalieten (grote stenen). .......................... men om grafkamers en steencirkels mee te maken. ........................... één deksteen die daar bovenop ligt. ..... with one of Europe’s largest stone circles. Avebury Bronze Age stone circle. It is a World Heritage Site and one of the largest prehistoric monuments of this type in Europe. Stone Age — The period of British prehistory from the earliest known inhabitation by humans to approximately 2000 BCE. Bronze Age — The period of British prehistory from approximately 2500–1500 BCE. 800 BCE – 100 CE. they vary in diameter, size and number of stones and even shape - some are oval, others are set into earth banks. Depending on the area they were built in, the type of stone also varies, from limestone to the huge sarsen blocks of Stonehenge and Avebury. Many circles had associated outliers, often large single or double monoliths that stood either close to, or at some distance from the main circle, others had lines or avenues of stones that lead to the circle. These may have had some processionary value or have been used for astronomical sightings. poses cannot be doubted, some align with the rising and setting sun at significant times of the year, others with the course of the moon so it would seem that one of their roles was as ritual and meeting places to mark important times in the agricultural year. burial chambers in the south of England. Examples are the Stonehenge Trilithons and the Avebury Circle. A standing stone set apart from but seemingly related to a stone circle. perhaps over 3000 years old..
trenches in the shape, and filling them again with crushed white chalk. The best views of this are from as far north as possible, perhaps from Woolstone Hill. wanting the gods to see it! 110 m long , formed from deep trenches filled with crushed white chalk. This is a Neolithic chambered long barrow 50 m north of the Ridgeway. a mere 4000 years old! Human remains found on the site indicate that 14 people were interred in an earlier burial structure between 3590 and 3550 BC. It was once believed to have been the home of Wayland, the Saxon smith God. Wayland had his blacksmith’s forge in the burial chamber. If you were to leave your horse outside it overnight, when you came to collect it, your horse would have new shoes! A suitable offering as payment would have had to have been left too, though! 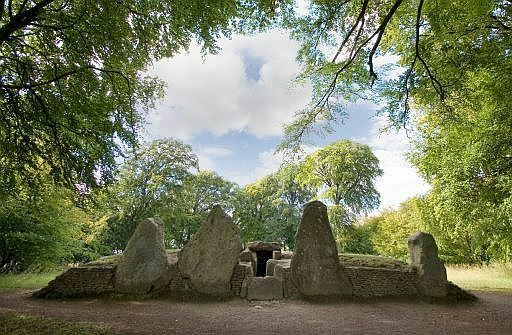 • Wayland’s Smithy a Neolithic chambered long barrow. • Plan of Wayland’s Smithy. • This is a rectangular or trapezoid mound (heuvel) built during the Neolithic (New Stone Age) and nearly always associated with burial remains. • Many are oriented with a higher end facing roughly to the east which contained either a timber mortuary enclosure or stone chambers. periods of time - sometimes hundreds of years, for the deposition or removal of remains. extended backwards between 20 and 120 metres. Naast long barrow .heb je ook nog round barrow. Wayland’s Smithy is a Neolithic chambered long barrow located near the Uffington White Horse and Uffington Castle, at Ashbury. It is situated very near to The Ridgeway. The later mound was 185 feet long and 43 feet wide at the south end. Its present appearance is the result of restoration following excavations undertaken by Stuart Piggott and Richard Atkinson in 1962-1963. They demonstrated that the site had been built in two different phases, a timber chambered oval barrow built around 3700 BC and the second stone chambered long barrow in around 3400 BC. The wooden mortuary house mainly consisted of a paved stone floor with two large posts at either end. A single crouched burial had been placed at one end and the mostly disarticulated remains of a further 14 individuals were scattered in front of it. Analysis of these remains indicated that they had been subjected to excarnation prior to burial and deposited in possibly four different phases. Postholes at one end have been interpreted as supporting a timber facade. The whole monument was covered by an earth barrow with material excavated from two flanking ditches and measured around 20m in length. The later stone tomb consists of two opposing transept chambers and terminal chamber, along with the longer entrance chamber, this gives the burial area a cruciform appearance in plan. It is classified by archaeologists as one of the Severn-Cotswold tombs. The large trapezoidal earth barrow erected over it was revetted with a stone kerb and its material was again excavated from two large flanking ditches. Excavation in 1919 revealed the burials of seven adults and one child. The site is important as it illustrates the transition from timber chambered barrows to stone chamber tombs over a period which may have been as short as 50 years. Hillforts liggen altijd op een heuveltop en hebben meestal meerdere wallen. They are fortified enclosures consisting of ditches (= grachten) and banks (ramparts) either of earth, wood or stone, or sometimes a mixture of all of these with one or more defendable entrances. Those with one set of defences are known as 'univallate' while 'multivallate' sites have two or more lines of ramparts and ditches. Hillforts are thought to have had many uses, as well as being symbols of prestige and power for local chiefs some were probably designed to offer protection during times of inter tribal tension and traces of dwellings have been excavated at some sites, while they could also have served as storage and distribution centres for surplus grain or the herding of livestock. viewing over the valleys, vital to anticipate danger. They could protect trade routes and land more effectively. • Uffington 'Castle' occupies the summit of White Horse Hill. It dates back to 600 B.C. At 857 feet high it stretches above the rest of the buildings in the county. Barbury and Liddington. Barbury is unusual because of its double moat. resultaten. Daar zitten de belangrijkste sites wel tussen. The western section between Overton Hill and Goring & Streatley has less provision and needs to be done as a three day block. The eastern section to Ivinghoe Beacon can either be done in another three day block, or broken down further. Breaking at Princes Risborough results in two two-day chunks. 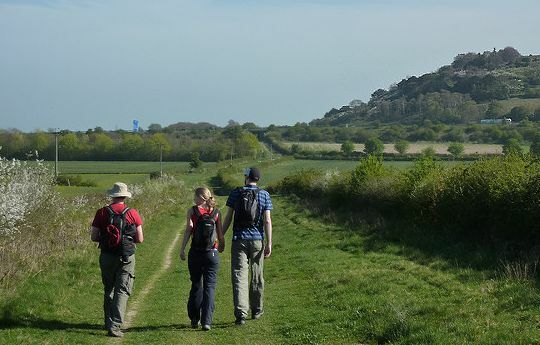 Alternatively breaking at Wendover will result in two trips – one of 2 days, and one single day walk. If you look at the Ridgeway on a map you’ll notice something important. It starts and ends in the middle of nowhere. This means you’re liable to want to slightly extend the walk at both ends in order to reach public transport. On the western side the best place to start is the village of Avebury (which has bus links) so you can admire the standing stones, long barrows and other ancient sights. From Avebury, head south to Waden Hill, then visit West Kennett Long Barrow, before heading to East Kennett, then Overton Hill. This is a section of a circular walk shown in the official Ridgeway guidebook. At the eastern end there are a couple of options including the 7½ mile Ridgeway Link to Dunstable. A far shorter version is to walk to nearby Tring railway station in a loop by visiting the Bridgewater Monument and the village of Aldbury. Maar ik hoefde nog niet naar huis en had besloten de 'Ridgeway' te gaan lopen, een oude prehistorische route over de kalkheuvels. Solidair stond ik ook om half zes op, om Jan en André naar de trein te brengen. Vooraf hadden we nog een gezamenlijke maaltijd, een echt Engels ontbijt, waarmee ik het tot drie uur bleek uit te houden. Eric had beloofd ook mij weg te brengen naar de start van het pad, bij Avebury. Twee dagen verwend en dan ook nog deze service. Dankwoorden schoten te kort, om half negen 's ochtends op deze prehistorische plek. Het museum moest zelfs nog open gaan. Ik nam de tijd om de 'stone circle' te bekijken. Een kring van stenen, veel verder uit elkaar staand dan die van Stonehenge, maar daarom niet minder indrukwekkend. Avebury is, meer dan Stonehenge, het centrum van vele prehistorische monumenten. Voor het bezichtigen van die brokken geschiedenis had ik eigenlijk wel een dag uit kunnen trekken. Iets zuidelijker lag Silbury Hill, de grootste prehistorische opgeworpen heuvel in West-Europa, waarvan tot op de dag van vandaag niet bekend is waarvoor hij gediend heeft. En daarachter had je West Kenneth Long Barrow, een redelijk intacte langwerpige grafheuvel, vergelijkbaar met de Drentse hunebedden. Helaas liggen beiden niet aan het officiële pad. Vanaf Avebury volgde ik de enigszins gerestaureerde Kenneth Avenue, een prehistorische laan die afgezet is met enorme stenen. Toen Stukeley de plaats in 1723 tekende stonden er weliswaar nog veel meer stenen overeind, maar desalniettemin is het imposant. De avenue moet eens naar Overton Hill hebben geleid, waar ook de Ridgeway begint. Dat wil zeggen, het lange-afstandspad, want de oorspronkelijke prehistorische ridgeway begon al aan de kust in Dorset en liep via Stonehenge. Het lopen over het lemen pad ging erg gemakkelijk. Na aanvankelijk wat spetters was het prima wandelweer, veel zon en veel afkoelende wind. De eerste gestage klim van pakweg honderd meter bracht me op de heuvelrug waar het pad constant overheen bleef lopen. Uitzichten alom, voornamelijk naar het noorden. Ik lunchte pas toen ik water gevonden had, uit een kraan bij een drinkbak voor vee. Het probleem van drinkwater vinden zou nog vele malen terugkomen. Dezelfde middag nog, toen ik op zoek was naar een kampeerplek. Er zat weinig anders op dan door te lopen tot enige bewoning. Tussen de akkerlanden door, waar de graanoogst in volle omvang begonnen was, bereikte ik uiteindelijk een pub, op de kruising van een oude romeinse weg met de ridgeway. Het netjes gemaaide grasveldje op de hoek mocht ik gebruiken om de tent op te slaan. 's Avonds stelde ik de kroegbaas niet teleur. De hitte om half tien 's ochtends, toen ik de pub de rug toe keerde, beloofde niet veel goeds. Ik kwam maar moeizaam vooruit. Het heiige benauwde weer ontnam me alle energie. Toen ik na anderhalf uur bij Wayland Smithy's Cave aankwam, gooide ik de rugzak af. Een fraaie plek, overigens. De langwerpige grafkelder, vergelijkbaar met West Kenneth Long Barrow, wordt omringd door een ovaal van statige beuken, waarvan ik de schaduw best kon waarderen. Bij gebrek aan een fototoestel besloot ik de entree van de grafkamer vast te leggen in een tekening. Toen ik jaren later de mollen-kroniek 'Duncton Wood' van William Horwood las, kon ik zijn beschrijving van de plek dan ook zeer helder voor de geest halen. De historische plaatsen die ik verderop langs het pad tegenkwam, Uffington Castle en de White Horse, worden eveneens in dit boek gebruikt. De White Horse, een prehistorisch kunstwerk, lag iets van het pad af. Van dichtbij was het moeilijk om de structuur te herkennen van de in de krijtrotsen uitgehakte vormen. De steile helling afdalen vond ik te veel moeite, hoewel het de enige manier was geweest om het gestileerde witte paard goed te kunnen bewonderen. Ik vervolgde het slingerende en golvende karrespoor over de heuvelrug, de brede Ridgeway. Tot aan de oversteek van de Thames is het pad met de bermen erbij zelden smaller dan tien meter breed, omdat het vroeger als dreef werd gebruikt, een pad waarlangs men het vee kon opdrijven. Het eerste deel tot de Thames is dan ook officieel bridleway, zodat er paardgereden en zelfs gefietst mag worden. De tip die Eric, mijn vriend in Reading, had gegeven, bleek dan ook zeer waardevol. Op de kaart had ik al voorzien dat de overnachtingsplaats een boerderij of 'wild' moest worden, want op korte termijn kwam ik geen bewoonde wereld tegen. De boerderijen lagen ver van het pad en toonden zich niet erg gastvrij. Toen ik er op ging letten bleek vrijwel elke oprijlaan van een boerderij getooid met een bordje: 'no water', 'private', 'no water obtainable here' of woorden van gelijke strekking. De plaatselijke boer moet blijkbaar niet zo veel van de voorbijtrekkende wandelaar hebben. Het kwam mijn humeur niet bepaald ten goede. Totdat ik op het juiste tijdstip een drinkbak voor vee trof die aangesloten was op de waterleiding. Met enige moeite kreeg ik hieruit wat vers water en parkeerde mijn tent in de berm van het pad naast een struik. Eric had me gewaarschuwd voor ruiters. 's Ochtends vroeg werd ik inderdaad wakker van een partij paarden die met een noodgang langs mijn tent denderden. Het hele gebied hier staat bekend als streek waar race-paarden gefokt worden. De op de kaart aangegeven 'gallops', paardenrenbanen, deden mij zulks al vermoeden. Streatley, waar het pad de Thames oversteekt, bereikte ik tegen de middag. De zon had me vroeg de tent uitgebrand en ik was blij voor de hitte al een flink stuk te hebben gedaan. Op zoek naar winkels kwam ik in Streatley in een grappig kaaswinkeltje terecht. Als Hollander verbaas je je dan over de prijs waarvoor 'Dutch boerenkaas' over de toonbank gaat. Aan de overzijde van de Thames had je ook nog de 'Riverside Stores', niet in de laatste plaats voor de plezierjachten die hier geschut worden. Overigens heet het plaatsje aan deze zijde van de Thames Goring. De poort die de Thames hier in de krijtheuvels heeft gesneden wordt dan ook 'Goring Gap' genoemd. De Thames is een markant punt in het Ridgeway pad. Niet alleen is het exact het halfweg-punt, het is ook een scheiding tussen twee verschillende landschappen. De grote golvende akkers waar de brede Ridgeway tussendoor loopt maken plaats voor een kleinschaliger landschap van akkers en beukenbossen met kortere steilere hellingen: de Chiltern Hills. De voortzetting van de prehistorische Ridgeway was hier de Icknield Way, die aan de voet van de steile noord-west hellingen van de Chilterns loopt. Aangezien deze oude route nu op sommige plaatsen verhard is, volgt het lange-afstandspad daar alternatieve paden door de heuvels. Ruiters en fietsers kun je niet meer tegenkomen. De afwisseling van een stuk lopen langs de Thames deed me goed. Vooral voorbij South Stoke, waar de bebouwing ophield en het pad pal langs de oever liep. Onderwijl zag ik in de verte de wolken samenpakken en zich vervolgens openen. Ik kreeg nog net een staartje. Het pad over Grim's Ditch, een greppel en dijkje die waarschijnlijk eens als grens hebben gefungeerd, was dan ook zeiknat van de regen. De grote hoeveelheid bomen en struiken leverde aardig wat koude douches op. Maar het was leuk lopen. Vijf kilometer lang ging het pad over het dijkje op en neer en van links naar rechts, waardoor je dusdanig geconcentreerd moest lopen dat de tijd ongemerkt voorbij vloog. Het paadje leek bovendien verdraaid veel op stukken van het Offa's Dyke Path en riep vele herinneringen daaraan op. Volgens mijn gidsje kon je op de golfbaan van Nuffield kamperen. Bij het clubhuis stuurden ze me echter door naar een pub. Alert op rondvliegende golfballen stak ik de 'golf course' over. De kroegbaas gaf me toestemming om op een vierkant veldje naast de golfbaan te gaan staan. Ik had goed en wel mijn tentje staan toen de een golfbal door de heg vloog en precies voor mijn tent tot stilstand kwam. Gevolgd door een geruite pet die om de hoek van het beschutte veldje kwam kijken waar zijn witte projectiel gebleven was. Gelukkig werd het snel te donker voor het golfspel. Het lopen in Engeland was weer ongebruikelijk. Het was die dag voor de verandering weer eens bloedheet. Grote stukken van de route liepen over de Upper Icknield Way, vergelijkbaar met de Ridgeway. Zo breed, dat de schaduw van de verspreide bomen in de berm het midden van pad niet haalt. Ik was het meest tevreden op de momenten dat de route door de koele beukenbossen en kleine graanvelden ging. Een right of way dat dwars door een korenveld liep, bood nog relatief veel schaduw. Maar ik had eigenlijk niets te klagen, na een tweetal natte weken in Schotland aan het begin van de vakantie. De vermoeiende klim door een beukenbos aan het eind van de dag werd bovendien ruimschoots beloond met een mooi voorbeeldje van het pub-kamperen: achter in de tuin van de pub, met twee honden en een kat als gezelschap. Een echte gedistingeerde 'country-pub', zo bleek later, toen de ene na de andere dure auto voor de deur parkeerde en de gegoede klasse uit de verre omgeving hun zaterdagavond er kwam doorbrengen. Ik verhuisde al snel naar de tent, waar ik me meer op mijn gemak voelde. Chequers was een mooi vervolg op de vorige avond in de pub. Op veilige afstand van het landhuis liep het pad om het gazon van het buiten van Mrs. Thatcher (de Britse premier) heen. De ongetwijfeld aanwezige veiligheidsagenten hielden zich knap verborgen; ik heb er geen gezien. Maar volgens mijn gidsje zullen er politieagenten uit konijneholen springen als je probeert het huis te benaderen! De rest van de dag was onbezorgd wandelen door afwisselend veld en bos. Tenslotte kwam de markante kale heuvel Ivinghoe Beacon in zicht, die een waardig eind vormt van het Ridgeway pad. De witte leeuw die je op een andere heuvel kon zien liggen is geen prehistorisch monument zoals de White Horse, maar een modern kunstwerk. De Beacon bleek een favoriet uitzichtpunt, vooral op een mooie zondag als deze, en ik liet me dan ook snel door het vele publiek verjagen. De rondzoemende radiografisch bestuurde vliegtuigjes vond ik nog het meest irritant.